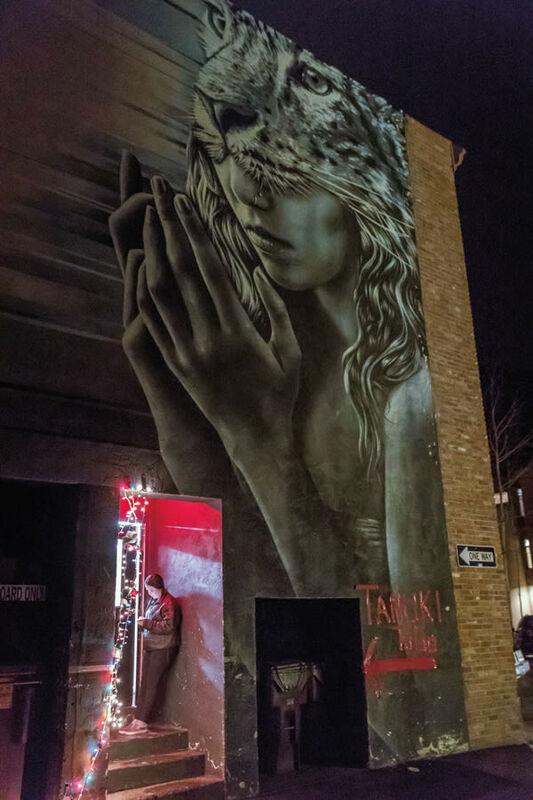 How a back-alley Asian pop-up became one of town’s must-go dining spots. The best and brightest of ideas, typically, are not conceived hours into an assembly of heavy imbibing while bemoaning a tough seasonal economy. But everything about Tanuki, which quickly became one of Aspen’s funkiest and most buzzed-about eateries when it opened in late February, is atypical—and that’s exactly how owners Adam Norwig and Jonathan Leichliter like it. Named after a mischievous (and mythical) Japanese shape-shifter, the restaurant opened as a takeout pop-up in the kitchen of nightclub Bootsy Bellows—less than three weeks after the pair of longtime chefs met at a local bar to lament their lackluster business during a snow-challenged winter. 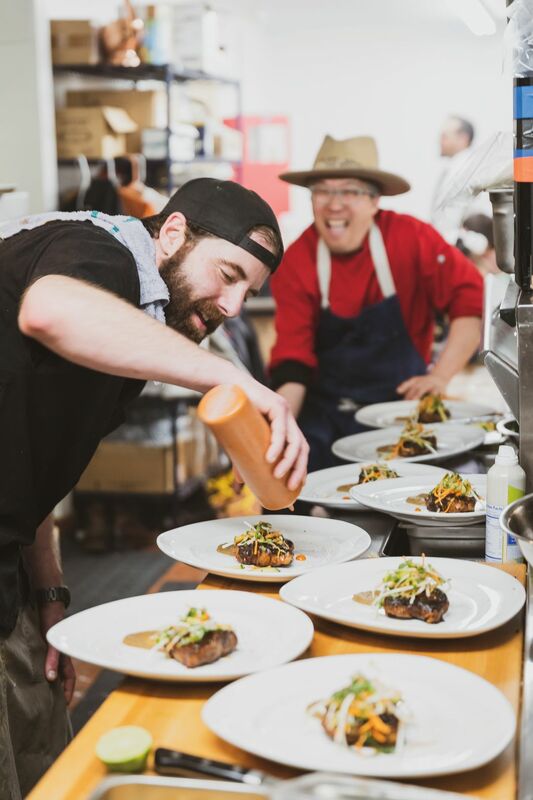 Feeling that Aspen lacked a certain type of gastronomic experience, the longtime chefs came up with a concept of serving gourmet Asian-style street food while upending traditional culinary expectations. He had developed a rapport with Bootsy’s owner, Andrew Sandler, after years of catering for the club and saw an opportunity in the space’s full-service kitchen, which could be accessed by the public via the back alley. With Sandler’s blessing and the better part of Aspen’s winter season behind them, the pair, along with Kirra Sherman (Leichliter’s wife and business partner in the venture), opened “on a wing and a prayer,” Norwig says. After a wildly successful 10-week run through spring, the eatery reopened this summer with a front-facing component, House of the Rising Tanuki-San, that seats diners inside the lounge and on an outdoor corner patio that accommodates more than 30, both closing up shop around 9 p.m. before clubgoers begin trickling in. In the back, what’s now referred to as Tanuki to Go will continue feeding customers who come in through the alleyway until the crowds die or until they run out of food, says Sherman. 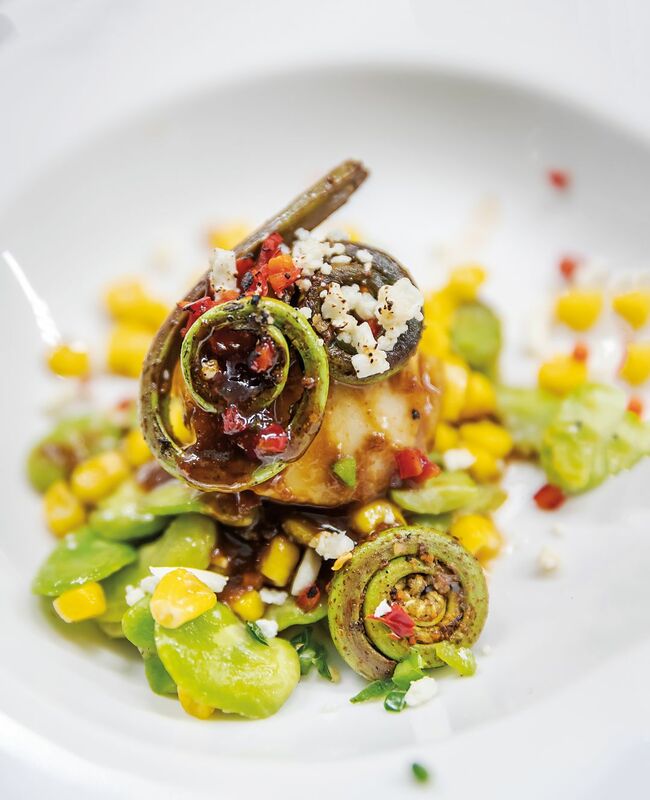 Drawing inspiration from Asian, American Southern, and French fare, Tanuki to Go boasts a colorful and eclectic menu, filled with playfully named dishes with serious flavor. Crispy Chinese chicken arrives atop a sweet-potato bubble waffle with charred scallions, bourbon maple syrup, and yuzu-roasted tomato hot sauce. The popular Thai tamarind coconut curry shrimp is paired with creamy cheesy grits, andouille sausage, basil, cilantro, and bok choy. A new and different menu for front of house includes a few favorites from the take-out selection, plus dishes like whole fried local bass with a Palisade peach gastrique and tataki-style New York strip steak. In its current iteration, Tanuki’s menu includes many of the dishes that Norwig and Leichliter first drunkenly dreamed up and penned on paper napkins. While the chefs hoped their concept would be well received, the response they got was overwhelming. 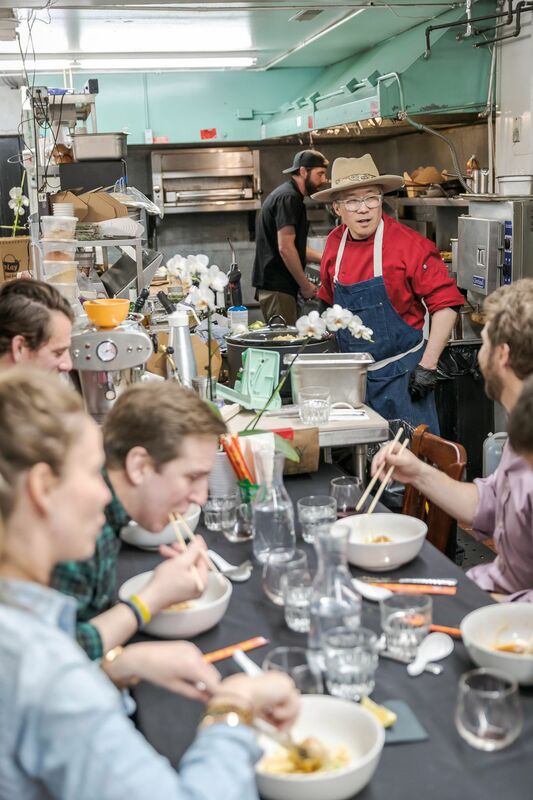 Leichliter notes the number of local restaurateurs—even those considered competitors—who helped out, from loaning woks and rice cookers to helping run errands and sending their staffs to eat at Tanuki. While he admits that the service industry tends to take care of its own, Leichliter says he’s never before seen nor experienced such generosity. “I guess it just goes to show we filled a niche in town,” he adds. But the rapidly increasing base of loyal patrons extends well beyond fellow hospitality worker bees, tantalizing the taste buds of locals and visitors alike and drawing a near cult-like following. A place at the five-course, white-linen, omakasé-style chef’s table, set in the middle of the kitchen, has become one of town’s most coveted seats. With an expansion to Austin, Texas, in the works, the quirky restaurateurs believe their journey is just beginning. If Tanuki’s Aspen success story is any indication, the Lone Star State won’t be the last stop.